Back to Vietnam this morning, to one of the most brilliant restaurant experiences I’ve ever had. On the banks of Hoi An’s Thu Bon River stands a beautiful, golden building. It’s clearly been there for a while, with the peeling and faded yellow paint and those little signs of decay that make buildings like this look so perfect. I would have thought a building like this would house a crappy, touristy restaurant, with a Vietnamese-by-numbers menu and overpriced seafood, but the sight of that little terrace overlooking the river and street below was too much, and we decided to treat ourselves to a “fancy” dinner one night. Long story short, great decision. The service was amazing from the moment we stepped up past the entry threshold – the Vietnamese are so friendly and genuine, you never feel like an imposition or that they’re only being nice because they’re employed to do so. Seated up on the terrace, we had the perfect view. And the menu was phenomenal… We over-ordered, obviously, but really couldn’t help ourselves! 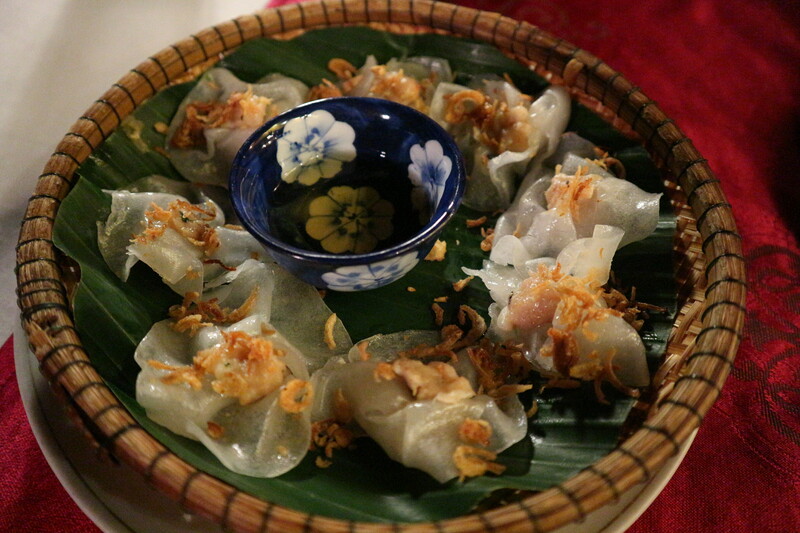 White rose dumplings topped with fried shallots and dipping sauce. DIY rice paper rolls with grilled pork skewers, bahn cuon, and salad. We thankfully got a quick crash course in the proper way to layer and wrap these, and they were great! Duck salad. This was amazing! So fresh, perfect mid-meal palate cleanser, but it would have made a perfect meal on its own, too. Husband’s choice – beef noodles with veggies. He loved it. And my choice – prawns cooked in coconut milk. This was magic, pure and simple. The best seafood dish I have ever eaten, my goodness it was good! Plus a few beers for husband, and a few coconut waters for me, I think we paid around AUD$60.00 for all of that… we couldn’t believe it! The prices was ridiculously cheap for the amount and quality of the food we had, the view was the best in the city, the service was wonderful, and it was the perfect dinner experience. Don’t let appearances deceive you – add it to the list of places to eat at in Hoi An. And ask for a terrace table!